We had more ice and snow this weekend, meaning that school and work start times are delayed again today. It feels like we will never be through with this terrible cold weather. Looking on the bright side, however, maybe it means that we won’t have such a terrible hot summer! I’ll also make some banana bread for the freezer with some leftover bananas that have turned spotty. For more inspiration, head over to Org Junkie’s Menu Plan Monday link-up. 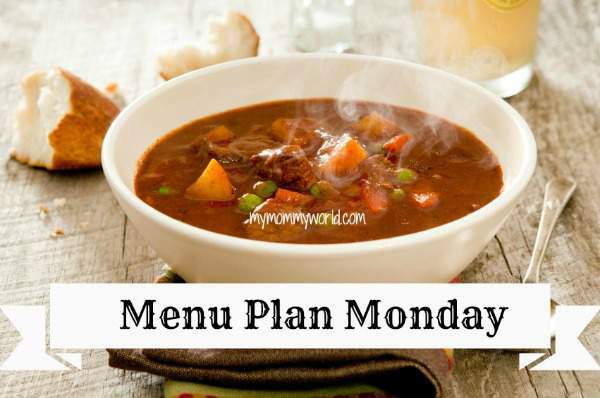 You can also check out my menu planning tips for busy moms to help you get started. I have so many bananas in the freezer, I think I will make something this week with them! I actually have pumpkin in the pantry that expires this month as well! Thanks! What a great idea for saving up old bananas! I hope you enjoy your yummy banana and pumpkin treats! My goodness, more snow and ice. You all are getting hit really hard. I hope this week is better weather wise for you. I’ve been craving some banana bread but we been eating all of our banana before they get spotty. Hope you have a good week. Oh yes, it’s been a terrible winter. And we are supposed to get some more tonight and Thursday. But it looks like the weekend is going to warm up a bit, so I’m hoping this is the last of it! Thanks Sandra…I hope they turn out well!